'All Is Not Lost': These Experts Help Save Hurricane-Soaked Heirlooms Hurricane victims can replace chairs, cars, even homes. But they can't replace family photos or VHS tapes of grandma. So the Smithsonian and FEMA have dispatched a "heritage task force" to Texas. 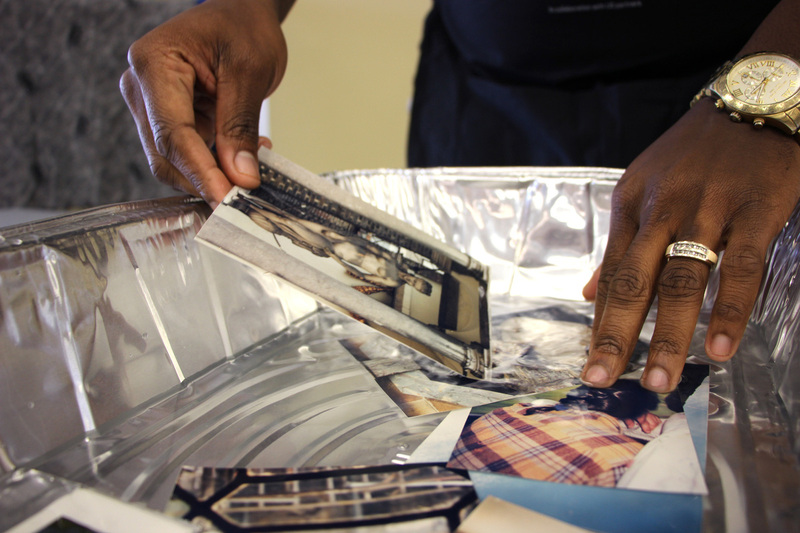 Museum curator Teddy Reeves demonstrates a method of salvaging damaged photos at a workshop in Beaumont, Texas. When you escape a catastrophe with the clothes on your back and your dog in your arms, people sometimes try to comfort you by saying the rest are "things" and things can be replaced. But, some things can't be — a family photo album, a scrapbook, grandma's quilt. That's what people in Houston are dealing with as they try to put their lives back together after Hurricane Harvey. And now, a small team of experts from places like the Federal Emergency Management Agency, the Small Business Administration and the Smithsonian are trying to help. Teddy Reeves is one of a group of experts at tables inside a former Goodwill store in Beaumont, Texas. He's normally a curator at the National Museum of African American History and Culture in D.C., but here he's part of the joint Smithsonian and FEMA Heritage Emergency National Task Force. Task force members like Laura Manaker have helped save photos, family Bibles and collectible prints. He's showing nurse Rebecca Collins how to salvage water damaged family photos by using an aluminum foil turkey pan, a paint brush, and distilled water. Collins is wearing her scrubs, and stopped at the recovery center for assistance, before going back to work at the hospital. Along with photos, she wants to save her academic materials. "Pictures, documents, also certificates," she says. "You know, like your diploma. And then, of course, I want my nursing books. Because it's very important." This program was launched last year, in the wake of the devastating flooding in Louisiana. Experts were also sent to South Carolina, following Hurricane Matthew. "We want to say we can salvage your grandmother's quilt," Reeves says. "We can help you salvage those photos from your high school graduation. Your high school diploma. 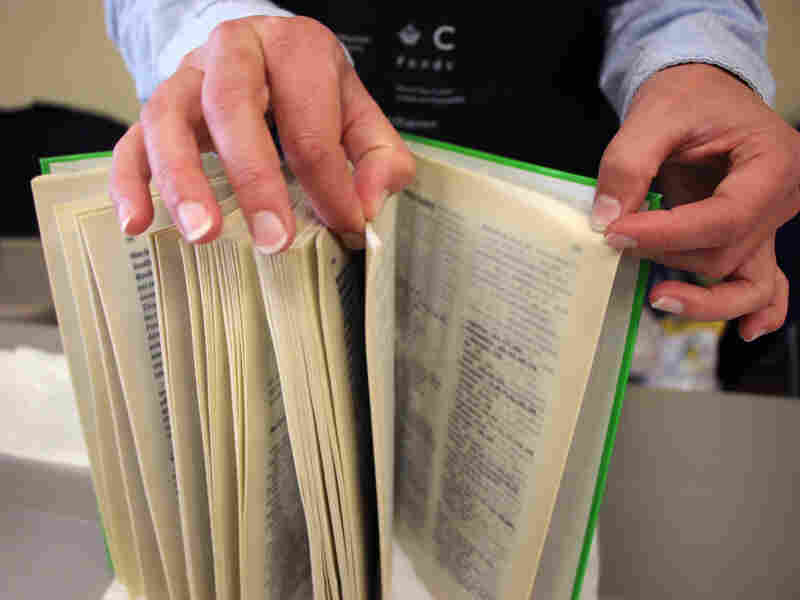 We had someone who came in with a generational Bible that was passed down in their family. We can help you salvage those things." That is, if you kept them. Diane Tinsley says she didn't know they could be salvaged. "When I went over there to wait for the line, I started crying, thinking of all the pictures I had just thrown in the trash," she says. Tinsley also threw away her thick family Bible, and most of her 357 record albums. "I should have researched it. But at the time, you're not thinking. I mean, I walked around in a daze. You know, you're just not thinking. You want that out of your house. And so you just start throwing everything away." Today, she's asking Laura Manaker, normally at the National Portrait Gallery in D.C., how to save her flood damaged collectable prints. "They all are stuck together, you know," she says. "There's probably about 35, 40 prints maybe." [W]e're trying to let people know that all is not lost. You don't have to throw out everything. For some items, it may be a relatively simple fix. Manaker tells her to put small weights on the corners of each print to prevent curling. But saving other things might be more trouble than it's worth. "There are things that you might not be able to save," Manaker says. "But we're trying to let people know that all is not lost. You don't have to throw out everything." FEMA and the Smithsonian say they're considering sending teams to Florida, Puerto Rico and the Virgin Islands, but so far, the logistics are too complicated — and right now people in Puerto Rico are more focused getting their basic needs met. Allison Lee is a reporter for Houston Public Media. Ted Robbins and Andrew Limbong edited and produced this story for the radio, and Petra Mayer adapted it for the Web.